When in March 1958 came to Warsaw the well known American Jazz' musicians George Wein and Marshall Brown, organizers of the jazz festival at Newport (USA), in order to engage in the International Youth Orchestra also somebody from Poland, after having heard many musicians their choice fell on a tenor saxophonist, Jan Ptaszyn Wrôblewski. The good fortune and a genuine talent became the second mile-stone in the career of this young man; the first one was his part in the I International Jazz Festival at Sopot, Poland 1956, in the band led by Krzysztof Komeda, the pioneer of modern jazz in Poland. Later on, Ptaszyn played with great success with „Jazz Believers”, along with leading Polish musicians A. Kurylewicz and A. TrzaSkowski, then he set up his own band which was giving concerts at philharmonic halls and jazz clubs. 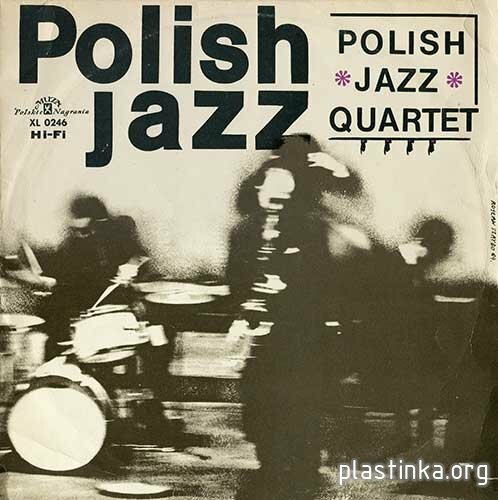 Finally, in his consistent striving for his „own face” within the Polish jazz, in 1963 he established a new group, the „Polish Jazz Quartet”. Their first performance took place abroad, at the International Festival at Juan-lés-Pins, Antibes (France). In the summer of the same year, on their way home, the PJQ dropped at the popular Parisian club „Blue Note”, where they played for several weeks along with Johny Griffin’s and Kenny Drew’s group. Their next artistic tournée led them to West Germany, and in 1964 to Yugoslavia. The quartet became one of the main sensations of the jazz festival at Bled. This resulted in a 3-month engagement (and radio recordings). After their return to Poland they appeared in the film produced for the German TV by the well-known West-German critic and jazz enthusiast J. E. Be-rendt (direction: Janusz Majewski). Their next success was at the VII International Jazz Jamboree in Warsaw in October 1964. The New Year 1965 finds them in the midst of their preparations for their coming concerts in Poland, Belgium, Scandinavia and Yugoslavia. Ptaszyn’s musicians are not out for showing solely their individual capacity of improvisation, they tend much more to make the PJQ a homogenous collective. They lay the stress on the quality of compositions and arrangements, on how they are playing and not just what they are playing. In their wish to reach the highest possible effects in their arrangements the band use experiments, however not the third-class or super modern ones prompted by the itch to be tremendously „new” and inventive. All they want is to find their own particular sound and then their style. This attitude finds its expression in the subjects and compositions by the band’s pillars: the leader and pianist. Joerrigo, проверил только что обе версии на яндекс.диске. Все открывается и разархивируется, никаких проблем с паролем. Попробуйте перекачать заново архив, может быть побилось что-то при скачке, а так же рекомендую обновить WinRar до последней версии. И убедитесь, что правильно вводите пароль! Это польская классика джаза.Кароляк и Вроблевский! !